I have made many butterscotch recipes, and most of them fall on their face with seemingly practical ingredients and flavor percentages. On paper, they look great but when mixed they usually disappoint. This recipe is a builder, and by looking at it you would think cookie or cake. It tastes like ice cream to me, and Ripple is the ingredient that changes it from a cookie/cake/pie to the ice cream taste. Butterscotch recipes need to be thickened much more than we would usually suspect. Typically we can do that with creams and vanillas, but with butterscotch, doing so takes away from the butterscotch taste. So, you have to find a way to thicken it, give it body, but by applying some of the ideas we use for cookies and cakes in DIY. Biscuit, Yellow Cake and Sugar Cookie are used here to create the body this recipe needs. It is the base for letting the butterscotch flavors build on. Butterscotch Natural is my favorite butterscotch flavoring and the most realistic tasting IMO. It's not an ice cream flavor, and to make it one I added the small percentage of Butterscotch Ripple. Ripple by itself can be overpowering in a mix. 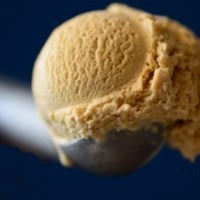 Here, it is a perfect amount to change Butterscotch Natural into something different without being overpowering...ice cream. Strawberry Ripe? Yep. Strawberry Ripe! At 4% it sweetens the mix and leaves you with a lip sweet feel on exhale. It does not overwhelm in the mix and at this percentage still keeps Butterscotch in the forefront as the primary flavor. I can tell it is there, and the exhale benefits here of sweetening the mix is my favorite part of this recipe. When I was a kid I can remember mixing butterscotch and strawberry ice cream together, and this was the imepetus for adding it in this recipe. To bring it all together and to add creaminess the trusted Vanilla Swirl and Cheesecake GC were used. They are the balancing act in many recipes and made the cut here. Brown Sugar helps to sweeten the Strawberry Ripe and I only added it so that Ripe's sweetness did not get lost with the base ingredients. It was in the first version I made of this, and although you likely could leave it out, I cannot convince myself that Brown Sugar Extra does not make Strawberry Ripe and Butterscotch taste better lol. This was made for a dripper at 20pg/80vg and a build outputting 5.88 volts. Dual 2mm micros @ .95ohms. Nice mix with a strong butterscotch flavor. I'd say it needs a good 2-3 week steep.